Finding grow lights can be difficult, but it’s even harder when you’re working with a smaller space. Manufacturers and many growers within the community are quick to say that bigger is better. But what happens when you don’t have space or budget for a giant grow set up? Well, you opt for the best of the smaller options. Many of these options are as good as their larger counterparts, and many use the same setup, cooling systems, and LEDs. This light has a 12-band spectrum which includes infrared and ultraviolet rays. Advanced Platinum as a name has a lot of respect throughout the growing community. The wide array of light helps stimulate photosynthesis, and the intensity is equal to the more expensive professional lights. The wavelengths available on the Advanced Platinum P300 Series 12-band LED grow light includes everything your plant needs throughout photosynthesis. The intensity remains constant which also helps their growth, but it fails to mimic the sun exactly. When it comes to coverage, the Advanced Platinum P300 Series 12-band LED grow light is one of the best in its wattage. From 18 feet you’ll see light coverage of 4.5 feet by 3.8 feet. However, the higher you raise the light over the plant the more dispersing you’ll see. There’s also the matter of leveling the light at the correct height because if it’s too low, you’ll have more intense light but may burn your leaves. Overall, the Advanced Platinum P300 Series 12-band LED grow light is a high-quality light. One of the best lights available for indoor gardening, the Maxisun Dimmable 300w grow light is perfect for cannabis. 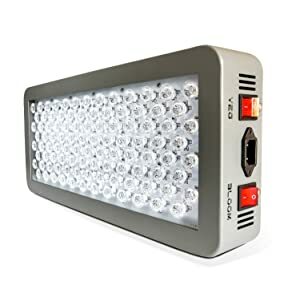 The Maxisun Dimmable 300w grow light uses 62 Epileds/Bridgelux but, each of these LEDs use placement to ensure that this panel offers great coverage, intensity, and even growth. The Full spectrum LED lights to include infrared and ultraviolet which make it one of the best values available. 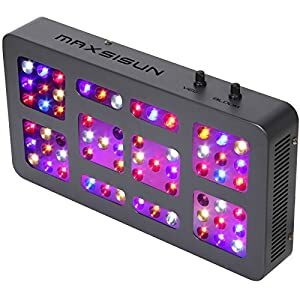 The Maxisun Dimmable 300w grow light is about 16-inches by 8.4-inches by 2.5-inches and has a recommended suspension height of 24-inches to 28-inches. The coverage of the Maxisun Dimmable 300w grows light is about 3.5 square feet. The Maxisun Dimmable 300w grow light comes with a 3-year warranty and a 60-day return policy. These lights are easy to use and affordable! The iPower 300 Watts LED Grow Light is engineered with 5-watt Epileds. These high-intensity epileds are capable of emitting full spectrum illumination required for plant growth. With this model, you get groundbreaking heat dissipation. The grow light is integrated with heat sink cooling vents made of upgraded 0603 aluminum. In addition, the cooling system also features low noise, high-speed cooling fans. The vents and the fans ensure the unit operates under normal temperatures. This is also an energy efficient grow light with a remarkably low power consumption of only 135 watts, compared to conventional models. Are you searching for booming lights to help you plant to grow healthy? Look no further than the MarsHydro LED Grow Light. 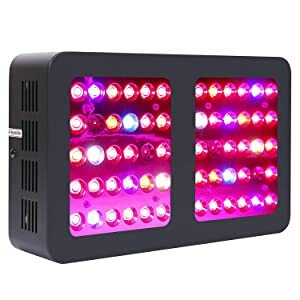 This light uses Epistar 5W LED chips that are high intensity with a superior photosynthetic active radiation that will effectively support the growth and yield of your plants. The Epistar LED chips are engineered to generate a full spectrum illumination that outshines CMH, HPS, fluorescent, and induction in similar wattage tests. The increased PAR ensures uniform light distribution. An attribute that protects your plants from sun-burning and stunted growth. This unit also scores a lot of points when it comes to cooling. It is fitted with a unique, heat sink venting system and a powerful, low noise fan optimal performance. Do you want to decrease the cost of your power consumption? 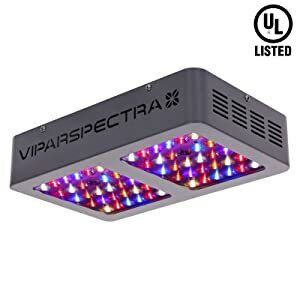 If yes, then do away with traditional growing lamps and settle for the Viparspectra Reflector Series 300W. It comes with a heavy-duty, compact design that is suitable for flowering coverage of 1.5 x 1.5 feet and vegetative coverage of 2 x 2 feet. This model is equipped with optimal full spectrum LED chips that deliver superior illumination for all forms of indoor growing, including bloom and veg. The LED chip technology used increases photosynthetic active radiation output by about 50%. This maintains the balance between coverage and PAR output for optimal performance. The compact design wouldn’t limit your coverage simply because this unit comes with a daisy chain outlet that allows you to connect multiple lights. 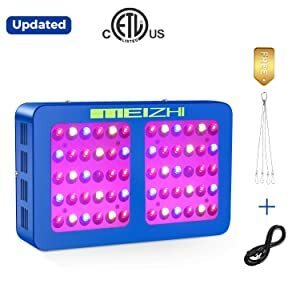 The Meizhi brand products are eco-friendly and ETL certified, and they have proven how innovative they are with the production of this amazing 300W LED Grow Light. One of the most impressive attributes of this model is the reflector design, which has no plastic plates or glass. Therefore, the light effect is not weakened. Unlike traditional LED grow lights, this unit uses Epoxy Molding Compound chip technology. This chip tech does not only deliver an optimal full spectrum but also extends the light’s life remarkably. 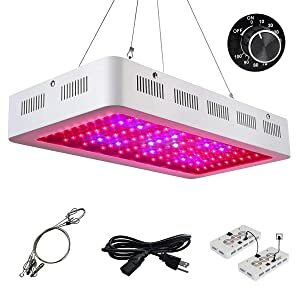 You will also be paying for an energy-conscious LED grow light that will go easy on your power bill compared to the high power requirements of traditional lights. Also, the Meizhi 300W LED Grow Light has a wider coverage of up to 5 x 4 feet. So, you never have to worry about buying multiple lights. Do you have a hydroponic indoor growing room/tent/box that requires superior illumination? 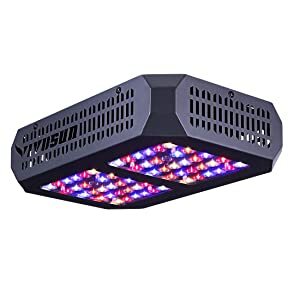 Look no further than the Vivosun 300W LED Grow Light. The first resourceful aspect of this unit is the reflector design that features a unique LED chip technology for a superior full spectrum and excellent light effect. It delivers more power for bloom and veg growth and superior photosynthetic active radiation values at various distances for optimal growth. The cooling system is also impressive, including a large, built-in five-inch cooling fan and large heat sink vents made of heavy-duty material. The coverage is a bit smaller with 1.5 x 1.5 feet for bloom, and 2 x 2 feet for veg. However, the light is fitted with a daisy chain outlet for multiple connections. The Releadro 300W grow light does best through the vegetative state of your plant’s growth. But you can also use the Releadro 300W grow light throughout you flowering or budding phase as well. This light uses the standard 5-watt chips. The 60 LEDs are angled at 120 degrees for optimal coverage. The Releadro 300W grow light claims to provide up to 25% more nutrients to your plants. Although we can’t back this up, there is a direct correlation between the Releadro 300W grow light and increased growth. This grows light is great for really small areas as it measures in at about 15-inches by 11-inches by 2.5-inches. The Releadro 300W grow light is extremely compact which makes it a favorite among growers that are restricted in space. The overall coverage is about 3-feet by 3-feet when you’re suspending the light from 18 to 24-inches. As your plants grow, it’s easy to adjust the height but if you’re looking to grow more than 1 plant you might want to get more than unit. Thankfully the Releadro 300W grow light is affordable enough to buy more than a single unit. Great value usually comes in small packages. With a 300-watt row light, you can utilize a small space to grow high-quality cannabis. These lights are almost always energy efficient and stay cool because of their size. But, what creates great value is the full spectrum of light, infrared, ultraviolet, and par map. You should also consider the intensity of lights. You want a light that will most closely mimic the suns natural rays! It’s difficult to guide new growers in the direction of lights because nearly every product claims to have a “full spectrum,” but there are a few problems with that. First, there’s no such thing as a perfect spectrum. Second, no entity tests these lights out to ensure the manufacturers’ claims are true. Finally, not every strain needs every wavelength. There’s no perfect spectrum, and the LED quality and volume of light emission varies by manufacturer. So what do you do to ensure that you get the light’s that are best for you? You should consider the ratio, or mix, of wavelengths and the bands of wavelengths. Some strains benefit from different bands or ratios. To maximize your yield and keep your plants happy you should do some research on the strain you’ll grow. A quick guide though can help you rule out some obvious choices. First, if you’re looking to make oil or increase bud yield, you’ll want a high mix of red light. But if you’re looking for something super potent you might want to consider lights with Ultraviolet and a high blue light mix. In the end, how you determine value relies on your end goal. Because you’re growing with a 300 watt LED grow light, you’ll probably only be using these plants for one purpose. That’s the benefit of a smaller grow setup is that you have a lot more control and focus on perfecting a single aspect. We’ve spent a bit of time talking about blue and red light mixes but how can you spot it? Unfortunately, on these subjects, you do have to take the manufacturers word. Many grow lights of any wattage, use a design that makes their light appear white to our eyes. As a grower, this is a benefit because you can identify any health issues with your plants and make immediate corrections. Discoloring and leaf deterioration is the best sign that you lack on PAR. Many manufacturers attempt to sell “white light” as a benefit. But, if your grow light has too many white toned LEDs your plants may be getting more green and yellow light than they need. When the get greener and yellow light, they’re missing out on the high-value red and blue lights that help them grow and thrive. Intensity is a big part of your plant’s life, and they need intense light. When you see the light advertised as “300W” or “900W”, this gives you some insight into the intensity of the product. The unfortunate thing here is that not all manufacturers use the same method to gauge wattage. Some grow light manufacturers measure the wattage the light drains at the wall. This calculation is how many other fixtures and plug-in devices gauge the wattage. However, is a light saying “600W” it could also mean that the light can replace a 600W HID light? Plants need intensity, and it’s important to know what you’re getting when it comes to value. Marijuana plants need a lot of sun exposure, so you want to be sure that your light can mimic the sun’s intensity. To determine if you’re getting decent intensity, it’s a good habit to review PAR diagrams from the manufacturers. When you’re working with 300w systems, you typically want one light that will be beneficial throughout the plant’s life. Using a single light will save you time spent researching and changing your light setups as well as money. But, having one light throughout the entirety of your plant’s life is a double-edged sword. Because you’re likely using a switch to adjust for the vegetative and blooming stages, you may shock your plants. Shock in light changes can stunt plant growth and bloom development. 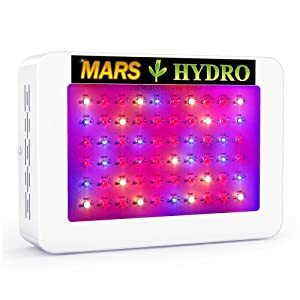 There are some lights, which are usually very expensive, that allow you to manually adjust the wavelengths to work your plants into their next cycle. The overall goal with the adjustable spectrum lights is to mimic the transition from a “spring sun” to a “summer sun” and finally to an “autumn sun,” but this is difficult to manage. If you’re new to growing, focus on using the products at hand. It’s probably best to purchase one light with switches for the different phases of growth which will allow you to learn more about your plants and how light affects them. The best pick is the Advanced Platinum P300 Series 12-band LED grow light. This light has the highest PAR, and lumens output for any 300-watt grow light. The intensity is also about twice as strong as its competitors. Although the Advanced Platinum P300 Series 12-band LED grow light is a little pricey, you’re paying value and longevity. You have both a vegetative and bloom switches to use throughout your plant’s growth cycle. This light is great for hobbyists, as well as new growers. This light is an investment that you can learn and grow with. It’s great for 2 to 3 full sized plants, but if you have more, multiple units easily chain together to cover a larger area.